On Tuesday evening, my sister Margaret and her family came down to celebrate our joint birthdays. I got some seriously cute pictures, too! 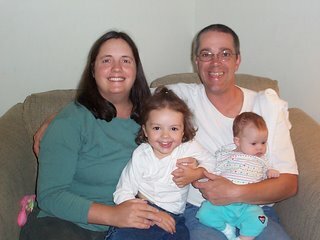 Here is my sister's family. We think this may be the first picture anyone has gotten with all four of them together. 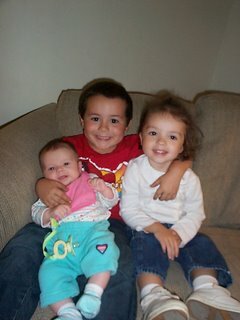 Here is Little Nephew with both his cousins. He's so proud to be holding the baby all by himself! 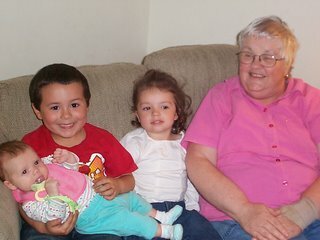 Here's one with my mother and almost all of her grandchildren (Big Nephew had football practice). 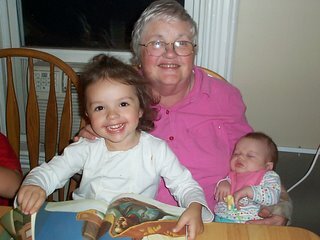 I got another picture of my mother holding both her granddaughters. The expression on the baby's face just cracks me up. Mom had just pulled the binky out of her mouth to take the picture. It was great evening. There was chinese food, cake and cuteness. What more can you ask for! Tomorrow, we will hear about Wanda and the Hole to China she seems to be digging in my backyard. those are some REALLY cute kids! i love how madeline has her mom's big smile, only huger. i gotta borrow some babies to settle the baby fever, even though my dad just wishes i'd have some already. You want the exact same smile, check out Margaret and Mom. We'll have to see about getting you some babies for a baby fix. my buddy elliott just became a mommy last night!!! at 9:30. i'm all wicked honored, because they called at 11 or 11:30 to tell me- i feel all high on the list! i'm totally going to find out about visiting and borrowing that baby! and now that i'm not gainfully employed, i can be had for paltry sums of money. The Baby Pants is among us? That's great news! You'll be the best auntie ever. I hope you get to see him(?) real soon! i got to hang out with a 5 week old for a bit last night. andy thinks babies are weird, and doesn't really like to touch them. but he said, "you look good with that. we'll see what we can do about getting you one someday." and he tucked the kid into a bassinette and patted his (the baby's) belly. so progress.... he's SO funny. i still need the pants- i adore him already!